I have attended a bunch of council meetings over the past few weeks and I honestly believe that the Councillors are seeking solid factual information. I think some of the parks and recreation staff may have already made up their minds on the project but this thing is a long way from over because it will come down to a township council vote. From what I understand there were 14 applications to be on the task for and 7 were against the current proposal, 3 supported it, and 4 were undecided or neutral. From the applicants they selected 2 from each group and a representative from the parent council of St. Boniface. I have been selected for this task force and I want to encourage anyone and everyone to please send me your thoughts, comments, ideas, and solutions to this situation. You can contact me at matthewlvandermeer2@gmail.com. 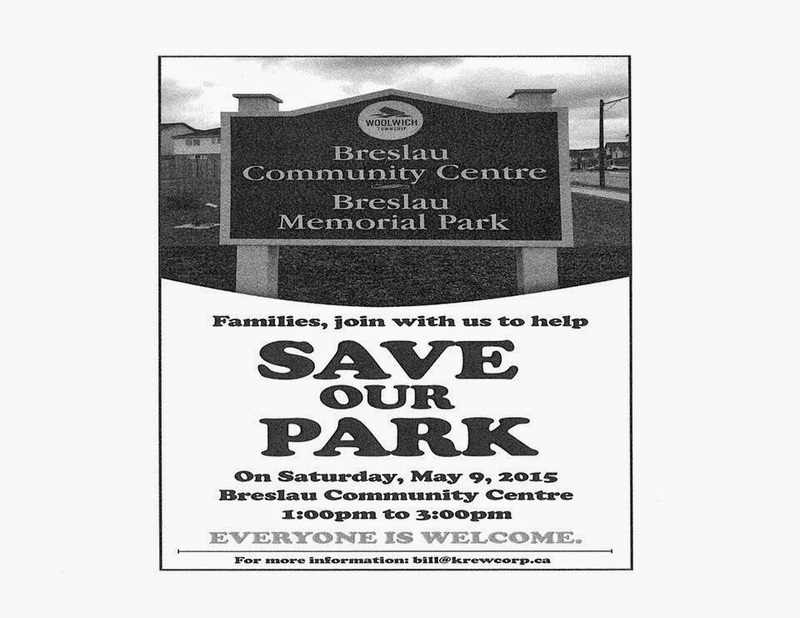 We as Breslau need to be in communication with each other and I want to hear from you if you support this project and why. Tell me what benefit I am missing. As the first act of my task force involvement, I attended a information session on Development Charges. The first thing that I would like to say about the topic is that it is very confusing and subject to change with little notice. The coles notes version of development charges is they are charged and used for supporting the development of infrastructure and services that support growth in a given region or municipality. What this means is any costs associated to improving the park facilities to support the growing number of residents could and should be supported via development charges. Unfortunately, it is a little more difficult and complicated then that because the projects that are required to support growth need to be identified and pseudo budgeted for within the context of a background study. The background study is then used to calculated the development charges that a construction company is charged. The background study needs to be repeated and updated every 5 years and staff must report to council how development charges are spent annually. So there is a lot of paper work and regulations here. A very important message that came from this session was if you donate money for a township project you MUST SPECIFY that your donation is for the NON-GROWTH related portion of the project. If you do this then the growth related part of the project can and will be funded via development charges. If you do not specify then your donation will be split 50/50 and then less development charges will be able to be used. Development charges are charged to developers to help the township cover capital costs of sustaining growth. Your donations are not for sustaining growth but should be used for enhancing existing services. This brings to my mind a significant question, nah rather a demand, that ALL 1.75 million from the sale of our park (providing this goes through) should be directly designated for NON-GROWTH related project expenditures. This demand is based on the fact that the development companies who built in Breslau were charged development charges to support the growth they were responsible for. Therefore, that money along with any other money charged to Breslau developers in the coming years should continue to be used to support Breslau GROWTH-RELATED projects and NOT used to pay down the $858 000 deficit in development charges for the Memorial Centre in Elmira. All development charges collected in Elmira should be used to pay that down instead of continuing to siphon off Breslau growth related projects. Finally, a group of residents are organizing a rally to show support for the park. Please take the time to consider stopping by the Community Centre on May 9, 2015 between 1:00 and 3:00 pm to show your support for the park. We all understand the limited options available to municipalities when it comes to growth and maintenance projects. However, we also understand the scarcity of parkland in our increasingly urban society. I am exited to be a part of this task force and have the opportunity to apply a strong voice for alternative options for this project. Development charges are a mechanism to support growth related expenses but are not the only revenue stream for our township. We have to continue to plan for our future and make Breslau a priority. We are one of the fasted growing settlement areas in Ontario and it is about time we start getting treated like one. PS. Stay tuned because this party is just getting started and you can expect more posts in the coming weeks.